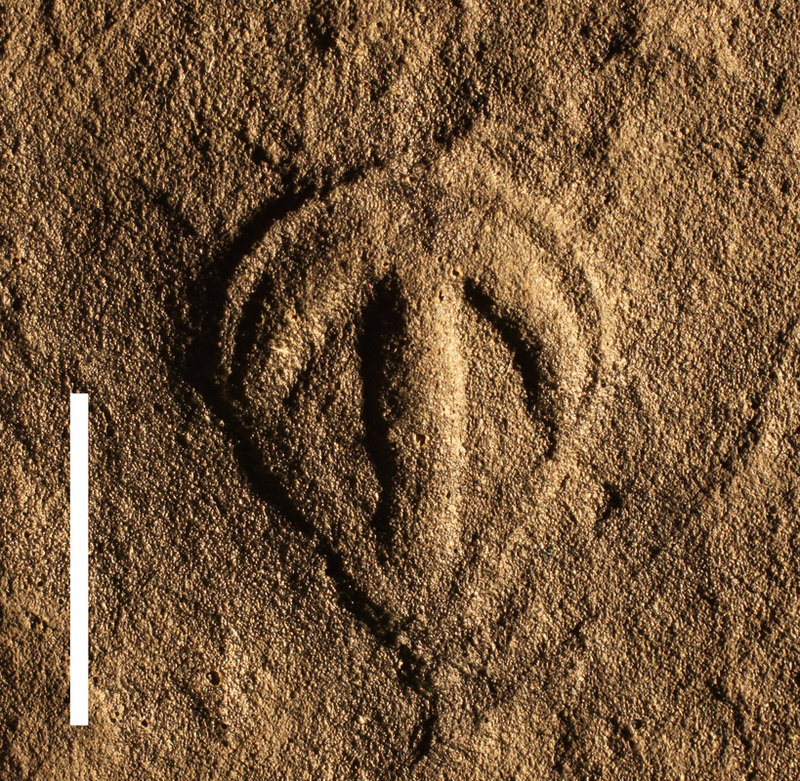 Parvancorina, from the Latin parva ancora (small anchor), was a small anchor-shaped organism that lived on the Ediacaran seafloor. Parvancorina has been suggested to be an ancestor of living arthropods (the group that includes modern crabs, shrimp and insects), however its phylogenetic placement is uncertain at present. Recent analyses of Parvancorina have demonstrated an association between its shape and bottom marine currents, suggesting facultative mobility (Darroch et al. 2017). As well as demonstrating axial alignment with benthic currents (Paterson et al. 2017), it has been suggested that juvenile specimens demonstrated a stronger alignment with currents, compared with adults (Coutts et al. 2018). These studies suggest that Parvancorina was a relatively complex organism and that its ecology and growth was strongly associated with the surrounding benthic environment. Parvancorina minchami, South Australia Museum specimen P49380. Scale bar = 1 cm. Image modified from Coutts et al. (2016). A small shield-like body, oval in outline, slightly wider in front (?) where its margin is curved in a low arc, and gently tapering to the rounded end. Margins slightly raised so as to form a rim which is little more prominent at the wider end. The centre is occupied by a prominent, smooth, anchor- or T-shaped ridge which is unsegmented and undivided. It is separated by a distinct furrow from the anterior(?) rim while its longitudinal bar rises above a flat surface between the converging posterior(?) contours. No appendages are known. The body of Parvancorina saggita is more elongate and narrow than that of P. minchami. The new species was described by Ivantsov et al. (2004), who demonstrated that the two species displayed slightly different growth trajectories. The body is elongated oval with a wider, tentatively anterior end. A narrow band slightly widened anteriorly and posteriorly extends along the margin of the body. The central part of the body is evenly convex in small specimens, while in the larger specimens, the central area is occupied by an anchor- like ridge. The transverse beam of this structure is arched, the distance between its ends is about half of the whole length of the structure. The longitudinal beam is straight and relatively wide.